Mercer Lake is open year round, and is home to some of the best rainbow trout fishing around, plus perch, bass, and bluegill. The ODFW stocks the lake several times each spring, and the trout can grow to trophy size. In addition, largemouth bass have been taken in excess of 9 pounds! 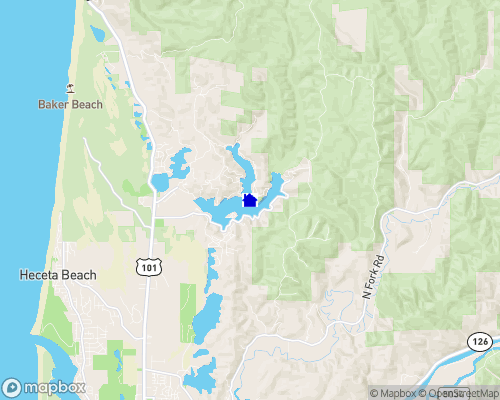 Mercer Lake Resort 541-997-3633, 88875 Bayberry Ln, Florence, OR 97439-8743 (Boat Rental) There are 31 sites for trailers/RVs of any length; four are drive-throughs. Electricity, piped water, cable TV, sewer hookups, and picnic tables provided. Flush toilets, sanitary services, showers, a store, a laundry room, and ice are available. Boat docks, launching facilities, and rentals nearby. Leashed pets are permitted.